Welcome to Petaling Street, the street that never sleeps. In the west, they have the city that never sleeps. At Kuala Lumpur we have the street that never sleeps. You claim you are adventurous; then you should not miss a walk down this road. 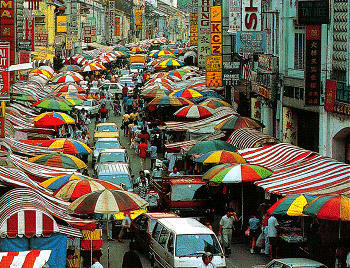 The street is bustling with life at the center of Kuala Lumpurs original Chinatown. To get to know what Im talking about, you have to make a visit at night! The place is fully alive with jostling crowds and noises that makes the street even more fun. I have noticed that the street has a new facelift. There are no more uneven roads, broken pavements and the huge colorful umbrellas that protected the goods sold from wooden pushcarts that were characteristic of the former street. 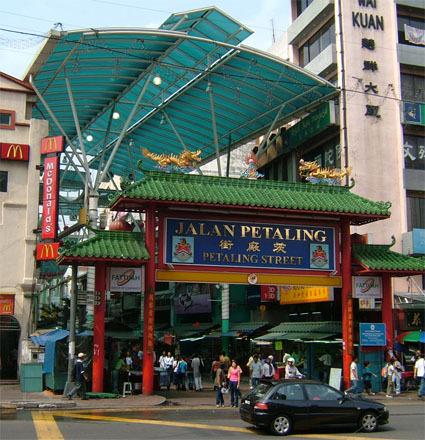 The new Petaling Street, or PS as it is affectionately known by the locals, is now sheltered with two large Chinese arches that welcome tourists at both ends. 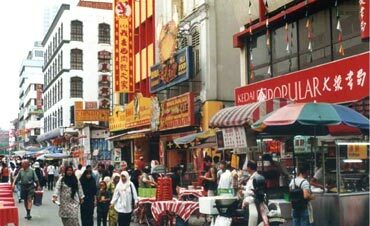 Petaling Street is known for its makeshift stalls where you can find very exclusive goods like watches, t-shirts, shoes, handbags and wallets. The brands at your reach include Seiko, Christian Dior, Nike, Prada, Louis Vuitton Rolex, Cartier, Addidas, and Armani which are offered at very reasonable prices. Not just the brands; everything is available here from bags to food, handicrafts to CDs, electronic items to fabrics, cheap clothes to DVDs, and every thing! Chinatown is also famous for its fascinating variety of jewelry items. There are many jewelry shops that sell beautiful items made in gold and adorned with sets of priceless gemstones. You also have a chance of sampling ginseng and different types of traditional Chinese medicines for all sorts of diseases at Chinese pharmacies. Talk about food and you are in food heaven, Chinese food heaven to be precise! As you shove your way through this street, nice aromas from restaurants sift through the air to the pit of your stomach and tease your appetite. You will be spoilt for choice. The restaurants are many and offer delicious varieties of food. Some restaurants have been in operation for generations. Dont worry if you do not know Chinese; patrons usually give complete menus with pictures of the food to enable you to visualize the food that is offered. One of the most popular restaurants, judging by the commonly long queues at it, is the Hokkien Noodles. Dont be in a hurry, hold your guard and when you are served, you will understand why there are long queues leading to the restaurant. Another fantastic restaurant is the Yook Woo Hin restaurant on Petaling Street which is one of the longest surviving restaurants that is run by a family. Need a quick burger? Well, only if you can squeeze your way through the people into McDonalds right at the heart of Chinatown in Kuala Lumpur. You can check into the 3-star Business Class hotels and hostels like Hotel Malaya, Swiss Inn Hotel and Army Hostel. Best advice: bargain, bargain and bargain again! 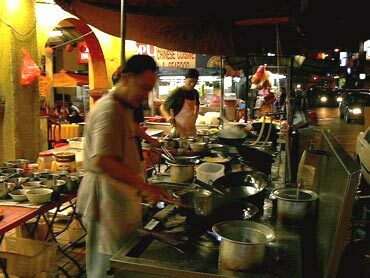 If you needed a course for bargaining, Petaling Street is the best place for putting your skills to the test. This is the best place for locals to get great goods at very low prices. Tourists get a taste of some of the most exclusive goods at reasonable prices.